CryoTechnoMed, a resident company of the Skolkovo innovations center, is the developer of a mobile therapeutic hypothermia unit for ambulances that cools the brain in an overheating situation. In cases of strokes, head injuries, poisoning, fever and other critical conditions, this device may be the only chance to save the patient’s brain neurons. To date, these devices have already helped 7,000 patients, and are used in 17 clinics in Russia. However, it is the emergency medicine that needs them most, for giving patients first aid in an ambulance, company representatives told Invest Foresight at the Open Innovations Forum. CryoTechnoMed was established in 2012, 80% owned by Oleg Shevelev, a professor at the Peoples’ Friendship University, and 20% by Olga Repina and Anna Lazebnik, according to Kontur.Focus service. The therapeutic hypothermia device was developed by Professor Shevelev. The first version was designed in 2014; a new generation device has been manufactured quite recently. The cooling device is controlled by a touch screen and two helmets with a special coolant that is safe for humans. 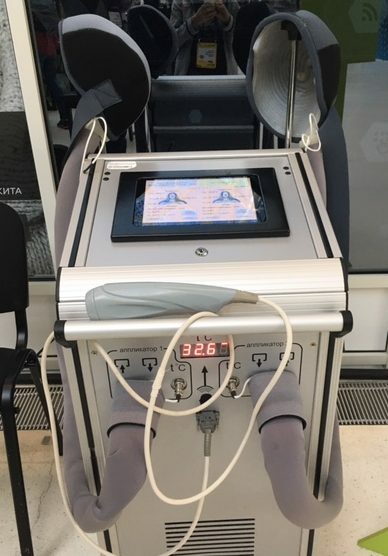 The machine is controlled by the program; its screen shows the time elapsed, the temperature of the helmet, the body temperature and the patient’s condition data. This data is stored in the device’s memory. The temperature of +41°C is destructive for the brain because its neurons begin to die. Depending on which neuron dies, the patient may lose the ability to move, to breathe, etc. In case of a stroke, edema is formed at the site of damage in the brain cutting the blood supply and oxygen delivery to the brain, leading to its death. No physiological procedures can cool the brain in such situations. The minimum temperature for the brain is +29°C; it was used in a stroke case once, and the procedure lasted 96 hours, a record duration. It takes 45 minutes to cool the brain by one degree; but neurons can be saved when the brain temperature drops by just one degree. Therapeutic hypothermia has been recently used to help patients in a vegetative state. “When a patient falls into a vegetative state, any attempts to change this state through medications have failed,” says Nikolai Kopytin, physician and sales manager at the CryoTechnoMed company. At the research institute of the Federal Research and Clinical Center of Intensive Care Medicine and Rehabilitology in the village of Lytkino in the Moscow Region, six patients have regained consciousness out of 15 who are in a vegetative state and undergoing treatment with the use of a therapeutic hypothermia device. Among them is a young woman who was seriously injured in a motorcycle accident and spent six months in a coma. After 17 procedures, she showed signs of consciousness; after a total of 22 procedures, she was transferred from the intensive care unit to the rehabilitation unit and began moving independently. Thus, another application of this therapy has come into use. Brain cooling shows good results in athletes as well. When applied prior to a training session or competition, the procedure allows them to endure a greater load due to a slower brain re-warming and consequently, a later onset of fatigue, so the athlete can show better results. Therapeutic hypothermia is irreplaceable in combat sports where traumatic brain injuries often occur, such as box, ice hockey and others. The procedure conducted on a patient immediately after they sustain an injury gives the opportunity to preserve their health and prevent disabilities, and allows them to have a longer active life. The targeted temperature management device manufactured by the CryoTechnoMed company costs RUR 3.4 mio ($52K), which is less expensive than their analogues produced in the United States, Europe and Israel, whose minimum cost is RUR 4 mio ($60K). The single-use helmets manufactured by foreign companies cost RUR50,000-60,000 ($900), while CryoTechnoMed uses their helmets for a period of over one year and even longer. Foreign specialists use total hypothermia; they believe that the entire body has to be cooled in order to cool the brain. Specialists at CryoTechnoMed note that the total body cooling has its by-effects, such as inflammation. “What is the point of the whole body cooling when high temperature kills only neurons and not internal organs?” Kopytin says. “Our device has shown positive results in more than 7,000 patients, while foreign analogues are yet far from this,” he notes. The targeted temperature management devices are used in 17 clinics across Russia. Intensive care units provide treatment free of charge, while athletes and companies have to pay for this service (the price is not disclosed so far). The more promptly medical treatment starts, the more effective it proves to be. This is the ‘golden hour’ rule. CryoTechnoMed seeks to have its devices included in the emergency medical treatment standard and make them available in ambulance vehicles and clinics. The company is now working on a mobile version of the device which will weigh about 20 kg, half the weight of a stationary device, and will be considerably less expensive. The new device is currently being tested.